Thanks to the embedded Bluetooth/NFC hardware the Smart function can send the memorized tests to the mobile devices equipped with the designated BlueForce Smart App. 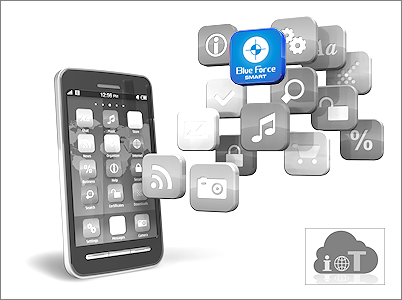 For ANDROID devices is necessary to install the BlueForce Smart App available on the Play Store, then with the Bluetooth enabled device you can view your tests with their graphics and parameters. 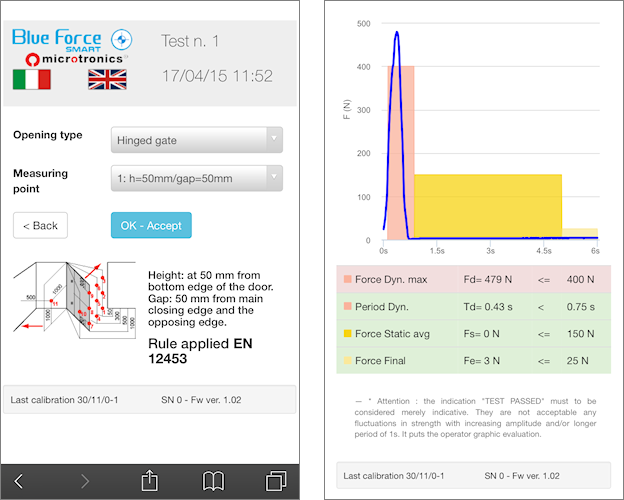 For Apple iOS devices is necessary to install the BlueForce Smart App available on the Apple Store, then with the Bluetooth enabled device you can view your tests with their graphics and parameters. For the devices provided with NFC system: by placing the Smartphone on the back of the BlueForce instrument, is it possible to view the tests with their graphics and parameters. After having sent the wanted test with the BlueForce Smart instrument to the Smartphone or Tablet device, it will be displayed the main page with the technical data of the measurements sent. Moreover, to verify the result of the tests it is possible to select the kind of closures and the distances of the measurements point. Every kind of closures is represented graphically according to the EN 12445, EN12453, DHF TS011 norms.